Visit www.evalcommunity.com for job postings, tenders and more! Visit www.evaluationcareers.com to view evaluation-related jobs! The latest issue of the EvalPartners Newsletter is now available! The FAO Office of Evaluation (OED) is seeking Expressions of Interest (EOIs) from qualified individuals to conduct the independent final evaluation of the project "Global Sustainable Management of Tuna Fisheries and Biodiversity Conservation in the areas beyond national jurisdiction (ABNJ)". Deadline for applications is Friday, 22 April 2016. EVAL is pleased to share the seventeenth edition of i-eval Flash news with you. Through this triannual electronic bulletin we provide readers with updates, news and information on publications and upcoming events related to evaluation. You are invited to alert us about any news item that you wish to include in the next issue at EVAL@ilo.org. Click here to read the latest i-eval issue. UNICEF is advertising a new opening: M&E Specialist - P3 (FT) with Jordan Country Office, based in Amman. This post will be primarily responsible for monitoring, namely: (1) programme performance monitoring in the complex humanitarian/resilience/middle-income country context, (2) tracking of situation of vulnerable children on a frequent basis, (3) real-time monitoring system for Makani and (4) dynamic field monitoring initiatives and exercises. Candidates with strong programme monitoring experience in a humanitarian, complex emergency or refugee context, and with experience in leading or designing data collection and analysis methodology to track situation of children on the ground and frequent basis, are encouraged to apply. This Request for Proposal for Services (RFPS) is posted for the UNICEF Supply Division in Copenhagen. Eligible and qualified service providers are encouraged to send in their proposal(s) by the response deadline. Click here to open RFPS document (PDF). There are still a fews days left for you to submit an abstract to the 12th EES Conference. Please do so! What can you expect to experience in Maastricht? 1. Building stronger partnerships by reaching out beyond existing contacts and traditional networks. Based on Conference participants feedback we have put more emphasis on evaluation in Europe. We wish to define, explore, deepen our understanding of the European evaluation tradition as we look to the future. At the same time we wish to maintain the unique international character of EES conference, and explore the implications of the Global Evaluation agenda 2016-2020 and the post 2015 iSustainable Development Goals. We will not do justice to the above priorities without new concepts, approaches and tools. This is where we need your ideas and your fulsome involvement. To facilitate participation we are planning free wheeling 'un-conference' sessions! DO NOT MISS YOUR CHANCE TO ​BE PART OF THE CONFERENCE PROGRAMME AND SUBMIT YOUR ABSTRACT NOW! Abstracts can only be submitted online. The Abstract Submission Deadline is 15 March 2016 (23:59 CET). To access the online abstract submission system, please click here. For more information on how to submit your abstract, please consult the Abstract Submission Guidelines available here. The 12th EES Biennial Conference will start on 26 September 2016 at MECC Maastricht. At this moment, there is a limited number of hotel rooms available in Maastricht and surroundings. If you have not reserved a hotel room, we advise you to do this shortly. MECC Hotel Service is the official housing partner of the 12th EES Biennial Conference. We have selected the best hotels nearby MECC Maastricht . You can use our user-friendly online booking system to book a hotel quickly and easily at the best price. If you have any questions, prefer not to reserve on-line or you need to reserve more than 9 rooms, please contact our service desk: mbs@mecc.nl or +31 (0)43 38 38 361. We look forward to welcome you at MECC Maastricht. Impact Evaluations: What are we learning from them that we wouldn’t otherwise? Please join UNEG, UN Women, & 3ie for a discussion on “Impact Evaluations: What are we learning from them that we wouldn’t otherwise?” Event details are below. Click the below image to be directed to the “Watch live” link on Tuesday, Feb 16th at 1:15pm. This international conference is organised by the Centre for Development Innovation (CDI), Wageningen UR, and Learning by Design, in collaboration with the PPPLab. The two-day conference (17-18 March) will connect the realities of those working in practice with ideas from people who are thought leaders on the partnership topic. Workshops, clinics and presentations will ensure a lively and thoughtful opportunity to question one’s own practice and find inspiration for new ideas. EvalPartners has released the latest version of their online newsletter. Click here to read the January 2016 edition. The IOCE AGM will be held via webinar. More details will follow in the coming weeks. Please share the date with your own VOPE members/network. UN Women, Claremont Graduate University and IOCE, under the EvalPartners initiative, with support from The Rockefeller Foundation and in partnership with UNEG, OECD/DAC EvalNet, ALNAP, UNICEF, ReLAC, IPEN and EvalMENA, are pleased to announce the opening of the registration for the first 2016 cohort of the introductory e-Learning programme on Development Evaluation, which starts on 19 January 2016. In the previous rounds, almost 25,000 participants from 172 countries registered, with a satisfaction rate of 72%. In addition, you can also create/customize your own course by taking the 10 units you are most interested, or take a few units and not an entire course (however, in this case, you won’t obtain a certificate). The e-learning is free and open to all interested evaluators. You may attend virtually from your personal or work computer anywhere in the world. The course includes on-line lectures, reading material and multi-choose tests. On successful completion of the e-learning course you will be able to print out a certificate of virtual attendance. For additional information, watch the introductory video by Marco Segone (UN Women Evaluation Office Director, UNEG Chair and former EvalPartners Co-Chair) and Natalia Kosheleva (former IOCE President and former EvalPartners Co-Chair). For registration, visit http://mymande.org/elearning/. Click here to read the article on the AEA website. As the International Year of Evaluation Ends, EvalPartners looks to the future in this new special newsletter. This has been quite a year! The International Year of Evaluation was full of gatherings and events promoting evaluation. Over 88 EvalYear events took place all around the world. – The final event of EvalYear is held in Pakistan (Dec 30 and 31). This special issue of the newsletter is intended to share with the global evaluation community a record of just some of the many activities which took place during the last two months of this extraordinary year. The full list of EvalYear events is available on the website. Read Caroline Heider’s blog on why evaluation is important for gender equality. The Sustainable Development Goals represent an ambitious development agenda towards the year 2030. Monitoring and evaluation will play a central role in ensuring and supporting effective compromise and implementation at country level. This major challenge also represents an opportunity to overcome gender blindness in evaluations that perpetuates and even reinforces gender inequalities. Reducing gender gaps is not only a matter of justice, but a key factor to boost development, productivity and poverty reduction. The launch of Evalgender+ in Katmandu inspired a group of women from different Spanish-speaking countries to produce a DECALOGUE OF EVALUATION FROM A GENDER PERSPECTIVE. This Decalogue offers input to include a gender perspective in evaluations and to help avoid the evaporation and technocratization of gender issues in the policy and practice of evaluation. We are pleased to share the Decalogue with the EvalGender+ community and invite all to give us your feedback and comments. Alejandra Faúndez and Marisa Weinstein (Gender, Evaluation and Human Rights group of LA&C Network of Evaluation ReLAC). The Independent Office of Evaluation of IFAD (IOE) has released its eleventh electronic newsletter. The aim is to promote transparency and share knowledge with partners and stakeholders about key developments related to IOE's work. After more than 30 years of growth in many dimensions, the Fifth Quinquennial Review (QQR), covering the period of 2011 to 2015, is scheduled for the first half of the year 2016. It will provide a timely opportunity to review past achievements, critical issues, and the current work programme, and to identify clear options for the future. The purpose of the review is both to provide accountability to the Board, ICIMOD Support Group (ISG), and other stakeholders and to strengthen ICIMOD’s functioning based on the conclusions and recommendations of the review. ICIMOD is seeking Expression of Interest from the consultancy firms for the QQR. Individual consultants don’t apply for this. Please structure your Expression of Interest (EOI) in the following format and submit by 31 January 2016. Please download the TOR for the QQR for your ready reference. Please view the ICIMOD website for more information. The Conference Organizing Committee of the Canadian Evaluation Society (CES) invites submissions from program evaluators for presentations at the annual conference which will be held in St. John's Newfoundland, Canada from June 5-8, 2016. Conference themes will explore the leading edge of evaluation in terms of approaches and methods, but also of technology, professionalization, influence, and culture.
. have never attended a CES National Conference. For more information contact rebecca_mellett@evaluationcanada.ca. Le Comité organisateur du Congrès 2016 de la Société canadienne d'évaluation (SCÉ) invite les professionnels en évaluation, membres de la communauté universitaire et autres présentateurs à soumettre une proposition de présentation. Les thèmes du Congrès explorent la fine pointe des approches et des méthodes d'évaluation, mais aussi de la technologie, de la professionnalisation, de l’influence et de la culture.
. n’avoir jamais assisté au Congrès national de la SCÉ. Click here to read the latest IEO newsletter. 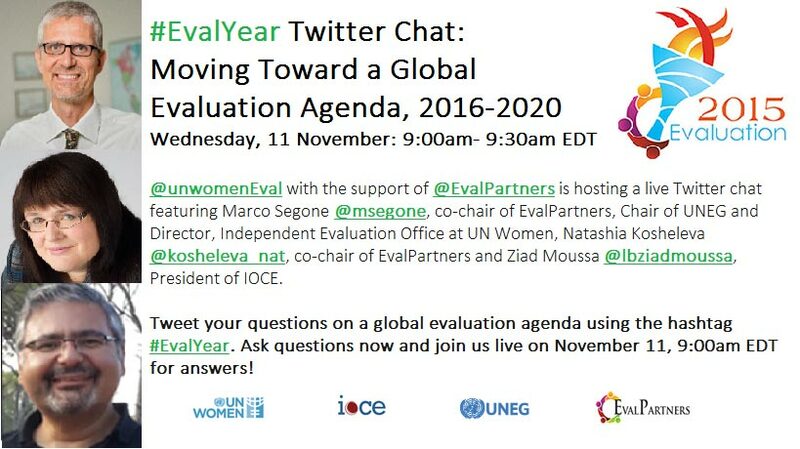 In culmination of the International Year of Evaluation and leading up to the EvalPartners Global Evaluation Week at the Parliament of Nepal, @unwomenEval with the support of @EvalPartners is hosting a live Twitter chat on leading the international evaluation community toward a global evaluation agenda from 2016-2020. Join us on Wednesday, November 11 from 9:00am to 9:30am EDT for a lively discussion featuring Marco Segone @msegone, co-chair of EvalPartners, Chair of UNEG and Director, Independent Evaluation Office at UN Women, Natalia Kosheleva @kosheleva_nat, co-chair of EvalPartners and Ziad Moussa @lbziadmoussa, President of IOCE. Tweet your questions and comments on a global evaluation agenda using the hashtag #EvalYear. Start asking your questions today and join us live on November 11, 9:00am EDT for answers! The Algerian Evaluation Network was officially launched yesterday Tuesday October 20th at the Mercure Hotel in Algiers. 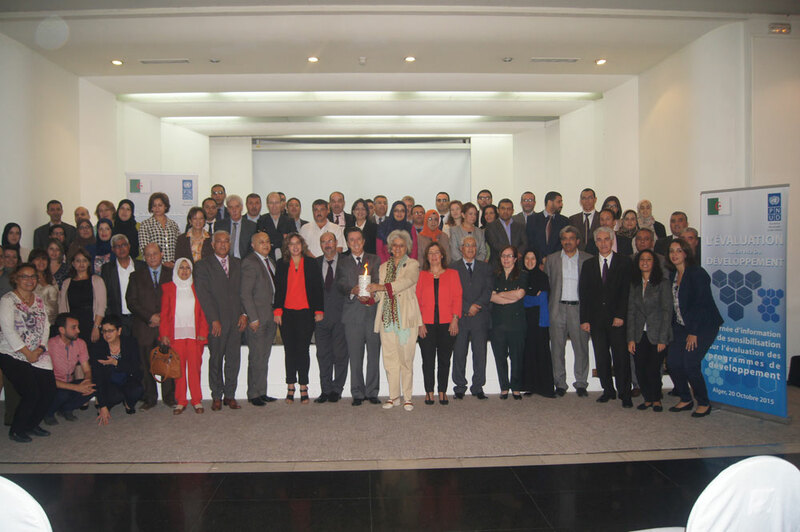 The gathering was a good opportunity to organize a successful Information and Awareness Evaluation Day co-sponsored by UNDP and the Ministry of Foreign Affairs of Algeria. Several high-ranked officials from the various ministries as well as senior Policy makers, international and national experts, civil society representatives and development Partners attended this exceptional event. A Torch was lighted on this occasion. A presentation was made at this forum a paper on International Cooperation in the field of evaluation and underscored the role of IOCE and Evalpartners in this area. 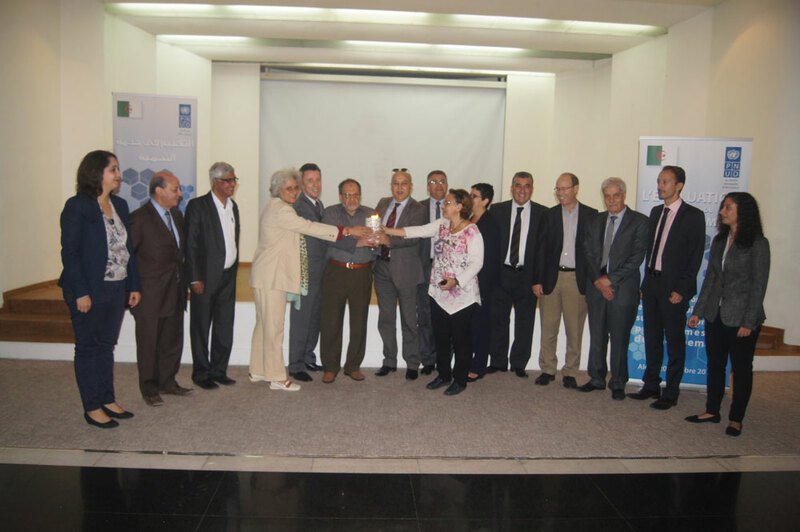 This fantastic achievement would not have been possible without the big efforts exerted by the preparatory committee including dedicated Algerian evaluators and representatives of UNDP, especially Mrs Sana Al-Attar, Head of Support to the Program and Mrs Cristina Amaral, UNDP Resident Representative in Algeria. Special thanks to our Colleagues Ziad Moussa, Marie Gervais and Asela for their continuous encouragements and valuable support. UN Women Webinar: What have we learned from evaluations of Corporate Gender Mainstreaming? UN Women Independent Evaluation Office and the Coordination Division in collaboration with the UNEG Working Group on Gender Equality and Human Rights are pleased to invite you to a webinar discussion and launch of the TRANSFORM Issue #5. The discussion is broken down into two consecutive sessions. Feel free to join for the whole discussion or join for a particular session. Session I (9am-10am EST) focuses on the insights, conclusions and ways forward for Corporate Gender Equality Policies based on the UN Women review of evaluations of these policies (see the Transform magazine). Session II (Appx. 10am-11am EST) focuses on how to enhance learning from evaluations of corporate gender equality policies based on the UN Women review and UNDP and NORAD's evaluations of their respective corporate gender equality policies. FAO Office of evaluation is seeking applications for the posts of team leader and team members for the Independent Evaluation of the Evaluation Function. Please send your CV to: Opportunities-Eval@fao.org indicating “Independent Evaluation of the Evaluation Function” in the subject line, no later than 31 October 2015. The United Nations Educational, Science and Cultural Organization (UNESCO) hereby invites qualified companies/individuals to submit proposals for the following assignment: Evaluation of UNESCO’s Associated Schools Project Network (ASPnet). • with extensive experience in the evaluation of networks and partnerships. The external evaluator(s) will be responsible for the development of the Theory of Change, the development of data collection tools, data collection and analysis including field work, as well as for drafting and finalising the Evaluation Report in English. The evaluation will be conducted between October 2015 and December 2015. The sealed tenders must be submitted to the UNESCO email address presented below on or before 18/10/2015 at 23:59 hours (CET), in strict compliance with the instructions as stipulated in the Solicitation Documents. Notes for a presentation to the 2015 Australasian Evaluation Society Conference, Melbourne, September 8, 2015. Click here to read the full presentation notes. Action/2015 is seeking a consultant or team of consultants to carry out the final evaluation of the action/2015 campaign. action/2015 is a movement of more than 2,000 organizations, networks and coalitions from over 150 countries coming together to raise awareness of how important 2015 is and to demand truly ambitious agreements on poverty, inequality and climate change in 2015. The action/2015 movement ensures that when political leaders meet and make decisions during two major United Nations summits convening in 2015, they will feel the pressure of millions and millions of people calling on them to take ambitious action to secure a better future for people and planet. The main purpose of the evaluation is to provide a comprehensive assessment of the action/2015 campaign, assess and describe the results and effectiveness of the action/2015 campaign (intended and unintended, positive and negative, as well as the major factors that influenced results), and draw lessons learned and provide recommendations for future campaigns and CSO coordination mechanisms. The evaluation will be conducted using a range of quantitative and qualitative methodologies. The following is a list of methodologies that are considered applicable; the list, however, should not be considered definitive and contractors are free to propose other methodologies. 3. Review of existing data on the action/2015 campaign (overall actions taken, monitoring reports of mobilization activities, registration & distribution lists, grant reports, etc.). The evaluation team should plan on utilizing the existing data being collected by action/2015 and triangulate the data gathered from various sources. Please find attached the Request for Proposals for this evaluation. • Submit questions about this terms of Reference (TOR) by e-mail to jobs@action2015.org on or before October 2, 2015, at 12:00pm EST. Action/2015 will return its responses to the questions on or before October 9, 2015. Questions and responses will be shared with all participating Offerors without reference to the originator. • Send applications to jobs@action2015.org no later than 16 October 2015, 11:59PM EST. UN Women, Claremont Graduate University and IOCE, under the EvalPartners initiative, with support from The Rockefeller Foundation and in partnership with UNEG, OECD/DAC EvalNet, ALNAP, UNICEF, ReLAC, IPEN and EvalMENA, are pleased to announce the opening of the registration for the third 2015 cohort of the introductory e-Learning programme on Development Evaluation, which will start on 23 September 2015. In the previous rounds, almost 25,000 participants from 172 countries registered, with a satisfaction rate of 72%. For additional information, watch the introductory video by Marco Segone (UN Women Evaluation Office Director, UNEG Chair and EvalPartners Co-Chair) and Natalia Kosheleva (former IOCE President and EvalPartners Co-Chair). For registration, please visit http://mymande.org/elearning/. Thanks to additional funding being offered by the MasterCard Foundation, IOCE/EvalPartners are pleased to announce that eight additional Young/Emerging Evaluators can now be invited to participate in the Global Evaluation Week. 23-27 November, at the Yak and Yeti Hotel in Kathmandu, Nepal. The Global Evaluation Week begins with the EvalPartners Global Evaluation Forum that will be held November 23rd and 24th, 2015. On November 25th, the final EvalYear celebrations will be held at the Parliament of Nepal, which is open for all Global Evaluation Forum attendees. On November 26th and 27th, the Community of Evaluators – South Asia (CoE-SA) Evaluation Conclave will be held, also at the Yak and Yeti hotel. Global Evaluation Forum attendees are welcome to extend their stay to attend the Conclave, with their registrations made and paid for by IOCE. There has already been a call and selection process through which 122 individuals have been invited to come to Nepal to participate in the Global Evaluation Forum. More information and the application form for additional nominations of Young/Emerging Evaluators can be found below. Click here for more information and the signup form (.docx format). Click here for more information and the signup form (PDF format).